First revealed way back in November, Amakuni's X and Zero statue at last has a release window: November, 2017. What's more, pre-orders will be going up on June 20th, 2017. This one is expected to be on the pricey side; I hope you've been saving up! I'll have pre-order links when the time arrives. Stay tuned. Official Mega Man 8 art, you can plainly see Roll tearing up in this art. What is it with the X fans and the drama fetish? I realize the X games have a slightly darker tone than the NES Megaman games, but this is unbecoming. It's twice as bad when they try to shoehorn it into the other Megaman series' with much lighter tones. "Slightly darker" you say? I don't see enemies dismembering anyone (Double, X4), villains running the hero through (Sigma, Day of Sigma), or final bosses blasting holes through protagonists, or half thereof (Sigma, X5), in the Classic series. The X series always had drama, pretty much from the moment you booted up X1 and say Light's dramatic warning message. 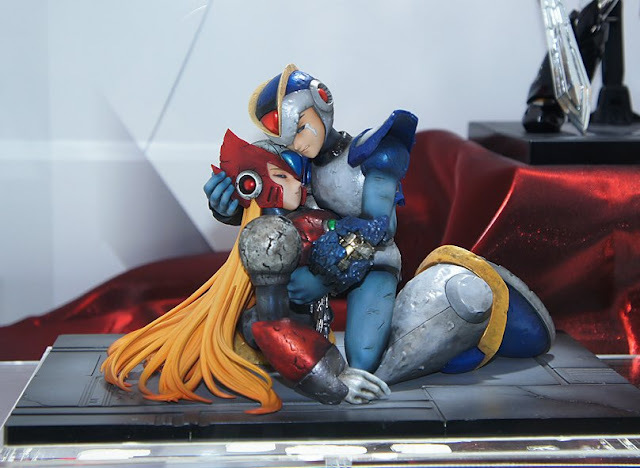 While this scene is from the manga, which is naturally more story-driven and delves deeper into the emotional capabilities of X and Reploids in general, it's still a very touching piece, yes? This is X, mourning over the death of his closest friend, who ironically was created to be the killer of all things Mega Man. It's a wonderful juxtaposition. Nippon Yasan has it up for about $200. Not as bad as I was expecting. It's 1/7 scale, so this thing should be pretty large on display. Sadly, it's a Hobby Japan online exclusive, so don't expect it to drop in price.